Tested and working. Cable is removable and can be changed out for others. I'm here to help. Shure SE846 earbuds in clear. 3 digit Date code on drivers # 188 & 257 or 378 & 378 or 257 & 188 or 108 & 108 or 188 & 188. MINT condition. I'm a musician / dj located in Chicago suburbs and these were my band mates earbuds that they used. SHURE E2C IN EAR SOUND ISOLATING EARPHONES w/ Built-in Microphone Case *E2*. Condition is Used. 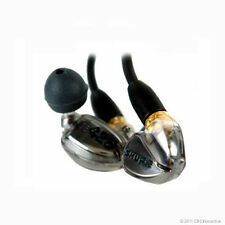 Very Good condition SHURE E2C IN EAR SOUND ISOLATING EARPHONES. Tested and working 100%. Includes earphones and original case. These are the E2's with a built-in mic added. Note: I based model number off what I could gather on the web. I’m not the original owner and other than SHURE markings there was no way for me to ID the model name. I believe these are E2C’s (an early model). That's why just any pair of earphones simply won't do. You need Shure SE535 triple-driver earphones. Also, SE535 earphones use Shure's sound-isolating sleeves to block out noise, so you'll be able to hear your music or yourself as you never have before. These earphones have triple drivers. The vocals mid range and high frequencies are beautiful. I'm a dj / musician from Chicago. We just upgraded them to different model. Nothing wrong with them work great as supposed to. Up for sale is a slightly used pair of Shure SE535LTD-J Special Edition sound isolating earphones. I've only used them a couple of times. You will find it hard to tell any difference from new. These feature triple microdrivers with a frequency response of 18Hz – 19.5kHz. All in the special edition red color. These are my favorite earphones of all time. I've heard fall more expensive earphones but always go back to these. In my opinion, they’re just well balanced with strong powerful bass and eloquent highs. I think you will be impressed too. SE535LTD-J Special Edition Sound Isolating Earphones. Condition is Used. Shipped with USPS First Class Package with tracking number. I offer a 30 day return policy. YES ALL THE ACCESSORIES PICTURED. Shure SE535 In-Ear Sound Isolating Earphones IEM (Triple drivers) clear used. Condition is Used. Shipped with USPS Priority Mail. Come with original box, all original ear tips, cable, carry case and document. Check photo for details. Parts only - no headphones. Also, Dynamic MicroDrivers' sound-isolating sleeves are available in multiple sizes in order to ensure a secure, comfortable fit. Music is a lifestyle here at Sweetwater. Like you, we listen to music when we're on the go, and Shure Dynamic MicroDriver sound-isolating earphones optimize the experience! Shure SE112 Wireless Sound Isolating Earphones with Bluetooth - Black. The latest Bluetooth wireless protocol gives your Shure SE112 Wireless Sound Isolating Earphones with Bluetooth Enabled Communication Cable superb audio fidelity and up to 30 feet of range, along with the best energy efficiency so far. Shure SE215 Wireless Sound Isolating Earphones with Bluetooth - Special Edition Blue. Are you wanting excellent in-ear monitors and not looking to spend a fortune?. Check out the SE215 Wireless Sound Isolating Bluetooth Earphones from Shure. Shure SE535 Special Edition Red - Sound Isolating Earphones. Tested and working. Cable is removable and can be changed out for others. Legendary Performance. Includes: S, M and L foam sleeves, S, M and L soft flex sleeves, yellow foam sleeves, triple flange sleeves, and carrying case. Sound Isolation blocks most background noise. Comfortable sound isolating sleeves block up to 37 dB of ambient noise. Shure Sound Isolating Earphones require a proper fit to achieve the best sound. Sound Isolating™ Earphones. Sound Isolating sleeves in multiple sizes provide up to 37 dB of isolation and a customized fit. Sound Isolating sleeves in multiple sizes provide up to 37 dB of isolation and a customized fit. SHURE SE215 FEATURES SHURE SE215 TECHNICAL SPECIFICATIONS - Sound Isolating Design blocks most background noise. Shure SE215 Wireless Sound Isolating Earphones with Bluetooth - Black. Are you wanting excellent in-ear monitors and not looking to spend a fortune?. Check out the SE215 Wireless Sound Isolating Bluetooth Earphones from Shure. The cable is reinforced with Kevlar for lasting durability. The in-ear design allows the earphones to effectively reduce ambient noise by as much as 37dB. A soft carrying case provides tangle-free storage. SHURE SCL2professional sound isolating earphones inexcellent condition. 56" sturdy cable with adjustable sleeve. Impedance (@ 1kHz): 16 Ohms. Sensitivity (@ 1kHz): 105dB SPL/mW. Sound Isolating sleeves in multiple sizes provide up to 37 dB of isolation and a customized fit. Comfortable sound isolating sleeves block up to 37 dB of ambient noise. Shure Sound Isolating Earphones require a proper fit to achieve the best sound. SE112 Wireless Sound Isolating™ Earphones with Bluetooth® Enabled Communication Cable Vivid sound with deep bass, the freedom of wireless, and the simplicity of Bluetooth. Includes SE112, fixed Bluetooth cable, USB charging cable, fit kit, carrying pouch and user guide. Shure se535 in good working condition, condition is used. Shure SE215 Wireless Sound Isolating Earphones with Bluetooth - Special Edition White. Are you wanting excellent in-ear monitors and not looking to spend a fortune?. Check out the SE215 Wireless Sound Isolating Bluetooth Earphones from Shure. 1 X Used Shure RED SE535 RIGHT Side driver only. this is authentic bought from musicians who bought them in USA from shure authorized dealer. there is 3 digit date code and you will get one driver with the following # 376 or 128 or 328 on the ear piece. Shure SE215 Special Edition (Blue). Special Edition (SPE) white and blue versions have distinctly tuned frequency response for extended bass. 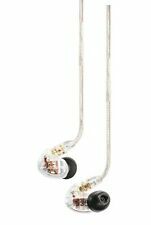 Looking for excellent in-ear monitors?. Not looking to spend a fortune?. 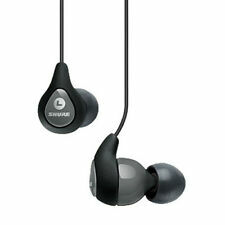 Check out the SE215 earphones from Shure. You may not know it, but these single-driver earphones outperform many dual-driver earbuds on the market. The SE530PTH earphones feature a sensitivity of 119 dB SPL/mW, an impedance of 36 ohms, and a frequency range of 18 Hz to 19 kHz. The Shure SE530PTH utilize three balanced armature drivers, one dedicated tweeter, and dual woofers, to bring you a listening experience that has been optimized for high-quality recordings and lossless formats. Newest version of well known Shure SE846 earphones with Bluetooth accessories in bronze color. There are three different sets of cables included. These are genuine products from Shure. Everything you'll receive is exactly as shown in the pictures. Shure SE535LTD Sound Isolating Earphones, Standard Light Gray Cable, Special Edition Red. YOUR BEST SOURCE FOR PRO AUDIO GEAR. The SE425's dual high-definition MicroDrivers provide you with definition that's far beyond the capability of most earphones. Shure SE425 In-ear Monitors Features Sweetwater is an Authorized Shure Dealer. Available in wireless and wired versions with detachable cables in multiple color options. Special Edition (SPE) white and blue versions have distinctly tuned frequency response for extended bass. Include zippered carrying case and fit kit with a selectionof sleeves for personalized fit and comfort. SE112 Wireless Sound Isolating™ Earphones with Bluetooth® Communication cable provide hour after hour of vivid sound with deep bass, the freedom of wireless and simplicity of Bluetooth. Sound Isolating™ design featuring comfortable sleeves that block up to 37 dB of ambient noise for extended listening, without distractions.